Just like with iCalshare.com, for those of you who don’t use this app you can also share calendar on iPhone 6 to others through via iCloud. On your personal calendar can only be seen by people who have iCloud accounts only, while General calendar can be shared by anyone with an Internet connection and a browser. Share your calendars, lets others know what you will do and can also give others the possibility to post events on your calendar. Press the Calendar button at the bottom. Press the red button on the right info if you want to share your calendar. If you want to create a new calendar, tap Edit → Add then tap done. Type the name of the person that you choose to share your calendars or press the plus sign (+) to select people from your contacts. Tap Add, then Edit Calendar and screen will appear and the names of people in your contacts will appear for you to select. Tap View and Edit to edit or delete a calendar that you have been share with other people. To find public calendars, press Edit Calendar to return to the previous screen and scroll to the bottom of the screen to find it. Tap On to allow anyone to subscribe to a read-only version of your calendar. You can send an e-mail or a message to the person that you want to invite to subscribe to this calendar, press the Share link to open share sheet. And if you want to share your post in other places such as Twitter, Facebook, or your blog just have to copy the link and share it on social media that you want. Then tap done. 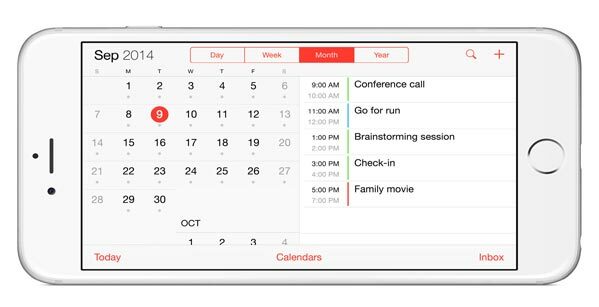 Those are a steps to share calendar on iPhone 6, you can find other iPhone 6 tips on another page.